Big Data and AI prototypes. We assess the strength and weaknesses of your employees regarding their data literacy level. One week sprint format during which we develop a complete and interactive new data or AI prototype with your employees. Need data scientists? We are able to assist you with your most demanding data challenges. is a set of strategic strategies that enable to develop new products, services or features with a special focus on optimal data usage, machine learning, and artificial intelligence. We developed a unique sprint format that enables you to build better data-driven services while building internal data competencies. Data is a sensitive issue nowadays. Explore the needs and wants of your users and develop new solutions that show you care. In order to work with data, you need to be good at math? Wrong. We show you a beginner-friendly way to start working with data and make it tangible for everyone. Explore the future of big data, machine learning, and artificial intelligence and understand where they differ and what use cases are relevant for your organization. Bring teams together and let them start working with data. 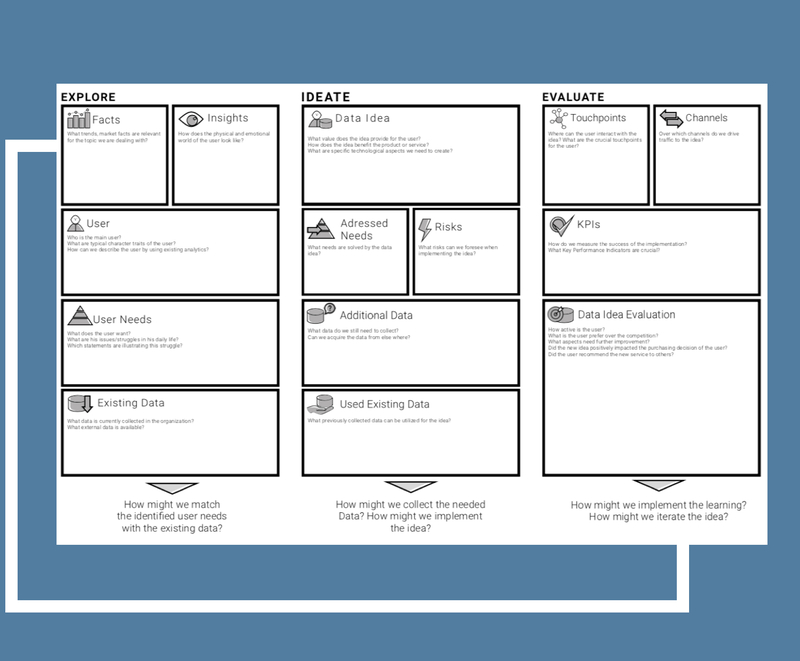 We developed the Data Innovation Board for teams in the process of creating new products and services while keeping an eye on data at every single design step. Apply design thinking and agile methodologies to develop data solutions that are usable and deliver value. Find a beginner-friendly way to start working with data on a tangible level. We understand you have some questions about our approach. Some of these you might find here. What data do you need for a data sprint! For the sprint alone, we do not need any data. It’s more on a conceptual level to understand what data is currently available within the company. Only at the second stage we require to understand more about the data. Who is in a sprint team and for how long? The sprint team consists of 5-6 employees of the client. They will be guided through the sprint team consisting of a facilitator, a data scientists, and a UX designer. The team doesn’t need to be available during the full sprint. They will only be crucial for the first two days to shape the success of the remaining sprint. Who should be learning about Data Thinking? The method is helping to bridge the communicative gap between IT and management. Hence, it makes sense to facilitate workshops with interdisciplinary teams. As an educational training, Data Thinking is ideal for leaders, founders, managers, product owners, and everyone who wants to understand data-driven products better. What is the outcome of a data sprint? As it follows the principles of a classic Design Sprint, the outcome is an interactive prototype that is ready to be presented in order to get the leadership buy-in. The specialty of a data sprint, however, is that you will also be presented with a first ML algorithm, a plan for the necessary data structure as well as suggested roadmap on how to get the data needed for the new product or service. AI and how business benefit from machine learning. It’s a good idea to check out our blog! Let us develop something together. Or let’s just have a ☕️ to see explore new data potentials.